AbateCo Services, as an Ohio licensed abatement contractor, provides complete asbestos abatement services as well as property/ building surveys to identify the presence of Asbestos Containing Materials. Upon identification, a plan of action can be developed to meet the customer’s needs. – Jon Fields | President, RestorePro | AbateCo. Asbestos can be found in many forms inside and outside of your home or building. Asbestos may be contained in paper or rigid insulation on hot water piping or heating ducts and furnaces. The US EPA has banned many asbestos products. Some other products are still legal, but have not generally been manufactured and sold in the US. Asbestos can also be found in floor tiles, sheet flooring, ceiling tiles and acoustical (stucco) finishes or as wall and attic insulating materials. Exterior uses for asbestos may include shingles or siding materials and asbestos cement pipes. Asbestos is a potential health hazard if damaged and disturbed through renovation or demolition activities. Potential future liabilities for the property owner are also attached to the presence of asbestos. Failure to advise your client(s) or contractors working on a project of the presence of hazardous materials in and/or on a property may present you with potential future liabilities. It is your obligation to protect the interests of your client(s), the health and safety of workers, and the natural environment. 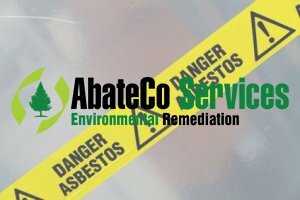 AbateCo Services, because we care about your health, safety and the environment. We are experts in Abatement. Call today for assistance with your project.